Although largely falling out of fashion as a method of payment, checks are still widely accepted at sports betting sites around the globe, including the United States. Essentially, when paying for something through check, a bettor issues a document (whether paper-based or electronic) that is tied to their bank account to the person or organisation they would like to pay. When the check is cashed, funds will be moved from one account to another. 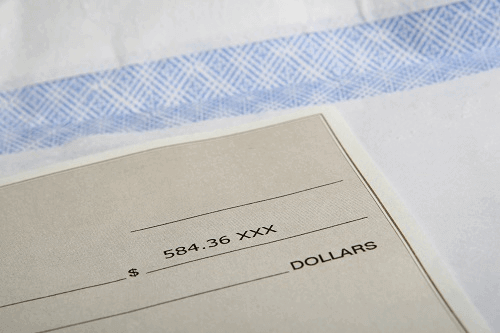 On this page, we discuss what it is like to use checks at online sportsbooks. This includes an explanation on how to use them to make a deposit, along with the advantages and disadvantages of using them. Contact the site’s customer support and alert them that you would like to make a payment to the site. The agent should inform you of all the relevant information that you need to put on the check. (Sometimes, this information is available on site and you won’t have to contact support. When the sportsbook receives the check, it will be processed and the funds debited from your account. This may take a few days. It doesn’t cost all that much to send a check. This means minimal banking fees when making a deposit at your favorite sportsbook. Unlike debit and credit cards, checks have no limits. This means that you can make bigger deposits using a check if you so desire. You’re less likely to overspend when making use of checks as your primary banking method at sportsbooks. As transactions aren’t instantaneous, you’re less likely to be tempted into make a deposit to recoup losses. Some avid bettors get sucked into making more bets when using their debit or credit card to fund their sports bets. They tend to be a bit safer to use than a bank card. The reason being that if a check gets intercepted, none of the issuers’ banking information can be stolen. It often takes a few days for checks to be processed, which means that it will take a few days before a person can actually begin making sports bets. The same goes for when making a withdrawal, except it usually takes even more time than a deposit. There are charges associated with using check as your withdrawal option. This could be anything between $20 and $50, depending on the site. Should You Use Checks at Sports Betting Sites? Well, quite honestly, we wouldn’t recommend it. This banking method takes a long time to process, which means it will take a while for you to be able to make sports bets too. Should you win any money, and request to receive your winning through check, it is also going to take some time for it to get to you. Ultimately, we only recommend using checks if you really have no other banking option available to you.